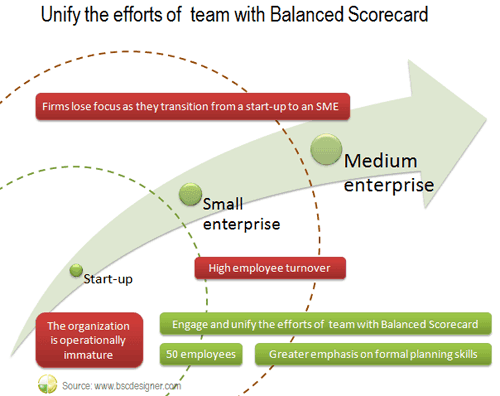 When Small Businesses Need Start Using Balanced Scorecard? 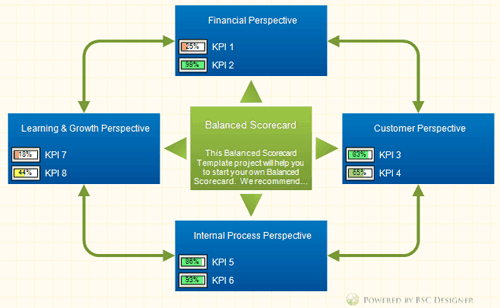 When a Small Business Need Start Using Balanced Scorecard? During my career as a HR professional, I have been exposed to a range of rapid growth start-up businesses, which has given me a rare insight into the challenges that organizations face as they move from being a small stage start-up to a small and then to a medium sized enterprise. In particular, there can be lots of: energy, creativity, activity, and goodwill, but this is often not channeled correctly, meaning there is a lot of wastage and a lack of focus in the right areas. The organization is operationally immature. But, there is a time in every start-up’s life when they must start making that transition into being a mature organization. In my experience, organizations start needing to make this transition from immature start-up to mature SMB /SME (Small and medium enterprises) when they hit around 50 people. If this transition phase isn’t correctly handled, the organization can run into quite serious trouble. What tends to be happening here is that you have a group of managers and staff who have been hired and groomed to work well in small, tight informal teams of people. They are geared toward working in a smaller environment. However, as the organization starts growing beyond 50 and 100 people, those skills that were suitable for operating in a company of 20 people, are less suitable for working in a company of 100 people, where there can be a greater emphasis on formal planning skills and advanced interpersonal and collaboration skills. As a result I have often observed high employee turnover at this stage as the less adaptable, early stage start-up employees leave and are replaced by SME geared employees. At this point, a lot of the knowledge and information used to operate the business leaves with those departing employees as documentation and systems tend not to be a priority. This makes it harder for incomers as the information they need to do their jobs is often not available. All this change in my experience can lead to a loss of focus, direction and energy. The solution to this problem is for me simple, and that is that employees need to be channeled so they are working in line with business goals. But, the problem is that small business geared senior managers are often not equipped to communicate business goals in a larger more established business. It needs a much more sophisticated system of communication and management than a quarterly town hall meeting, to engage and unify the efforts of a large work force. This is exactly the time that businesses should be using a balanced score card. As many of you will know a balanced score is a simple management concept where you establish high level business goals such as: growth, profitability, customer satisfaction, which need to be reached to meet the main goal. These goals are handed out to senior managers and may be divided further into sub-goals and handed out to middle managers and eventually staff, right down to the cleaner. Having this kind of balanced score card is the most effective way to motivate and channel employee performance towards meeting organizational objectives. Used properly it can create, restore and maintain, team cohesion, focus and direction in organizations going through the stormy transition between a start-up and an established business. Of course, back when I was first observing these growing pains, I could see that a balanced scorecard could be effective, but couldn’t see initially how time pressurized small business leaders would be able to implement what can be a complicated process. 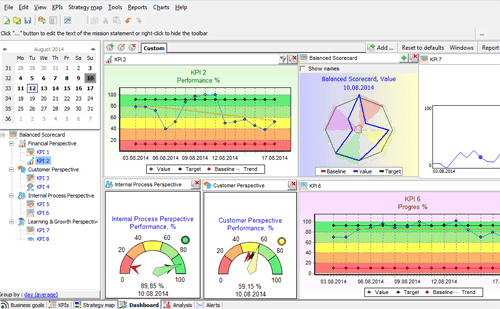 All that has changed now, as modern software applications such as the ‘Balanced Score Card Designer’ software (BSC Designer) automate much of the: analysis, preparation, reporting and presentation process, completely removing or reducing bureaucratic, administrative or technical barriers to using a balanced scorecard in a business. Using a tool like BSC Designer means you are not starting from scratch like you would be if you were doing it in Excel. The system has inbuilt: intelligence, tutoring and a framework which you can follow to implement a balanced score card into your business. And so if your executive team are too stretched, a smart business intern or PA could quickly set up and manage this system for your management team, if you didn’t have an executive free to do it. 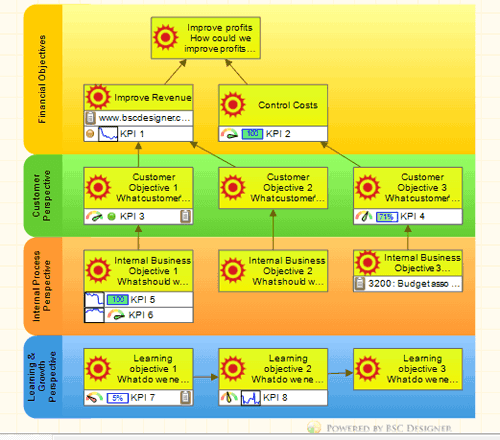 For example, to begin with the BSC Designer system by default includes the most common high level business goals which are: Financial, Customer, Internal Process and Learning and Growth. 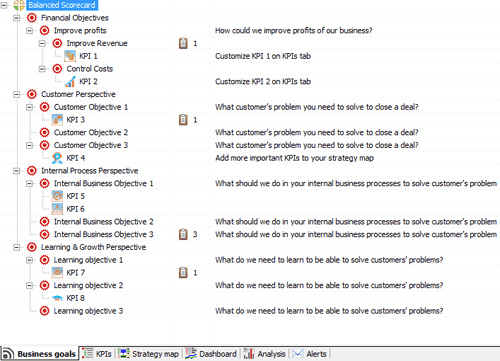 The system allows you to quickly add relevant KPIs/goals to each high level business goal. You can then add further levels of sub-goals to reflect your operational hierarchy. Of course, you can easily assign people to these goals and sub-goals, thereby aligning employees with organizational goals. The system then allows you to assign the parameters for each goal, e.g. what numbers represents success and failure to put it bluntly, and it will automatically calculate performance or progress against each sub-goal and goal, as long as you enter the actual value on a regular basis. You can assign update intervals for each goal, which means the system can also facilitate the updating process. 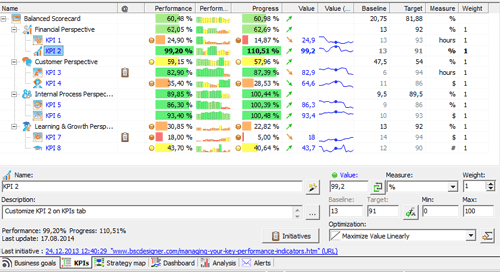 The BCS Designer system makes it easy for you to track overall performance against business objectives and to identify which specific areas of the business are failing to deliver effectively against performance goals. A range of reports can be automatically generated on the fly, including: Strategy Maps, Digital Dashboards, and Risk Indicators Reports. The BCS Designer is an example of a modern enabling tool that will make it much easier for you to manage your balanced scorecard implementation, and align your organization to your company’s goals, which is a crucial management challenge which companies must overcome as they move from a start-up to an established small to a medium sized enterprise. Kazim Ladimeji is the Director of thecareercafe.co.uk; thecareercafe.co.uk is a HR resource for start-ups and small businesses. Kazim is also an MCIPD qualified practicing HR professional with 17 years experience.